With the new year right around the corner, it's time to talk about the end of the 19th century, a time which plays an enormous role in Steampunk. If you've done any reading of British books written from about 1890 to 1899, you may have come across the phrase 'fin de siecle' and wondered what it meant. You also may have come across this term in reading about the late Victorian era. No worries, I'll tell you all about it! 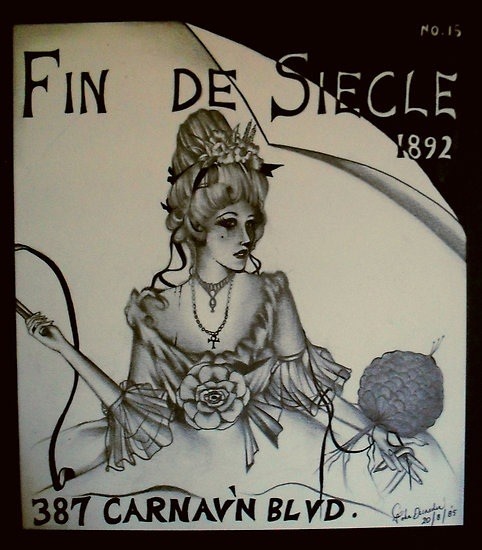 "Fin de siecle" literally means "end of the century" in French, but when used in the context of Steampunk or the Victorian era, it specifically refers to the end of the 19th century. In case you don't know French, it's pronounced "fahn deh see-ek-uhl". The term has been used retroactively to apply to the entire period from about 1880 to 1900, which was a pretty important twenty years. In fact, in many ways, the largest inspiration for Steampunk falls into that span. So "fin de siecle" refers to more than just a time in history, but also to the tumultuous social upheaval happening during that time as well. The people living in that period had seen their entire society reach unprecedented levels of wealth and prosperity, while at the same time watching the poor remain poor and many peoples around the world being oppressed. They became disenchanted, and were convinced that change was necessary, and that the end of all of it would be coming soon. As a result, the hallmarks of the fin de siecle are reactions to all of the things they saw as wrong with their era: materialism, the bourgeoise, rationalism, and more. It was a time marked by revolution, but not the sort with bloodshed. It was a prescient time because the end did indeed come in the form of World War 1, which started the real decline of the British empire. Does any of this sound familiar? A great empire whose corruption and wealth were leading to decadence? Reminds me a lot of America in the last decade, which coincidentally is the time when Steampunk suddenly became extremely popular. Or is it a coincidence? There are massive similarities between the fin de siecle and modern times, and it seems unlikely that it could be pure luck. Might I remind you that Steampunk has existed in one form or another since the 1960's, and yet it wasn't until 2005 that it experienced a meteoric rise to popularity. I'm not suggesting that the waning power of America is the sole reason for the popularity of Steampunk, but it does certainly provide interesting parallels to the fin de siecle. On the Wikipedia article for fin de siecle, it says that "the "spirit" of fin de siècle often refers to the cultural hallmarks that were recognized as prominent in the 1880s and 1890s, including boredom, cynicism, pessimism, and a widespread belief that civilization leads to decadence." All of those traits are prevalent in today's youth in Generation Y because they are in many ways facing the same stimuli as were present in the fin de siecle. For example, as I already mentioned, the waning power of a great empire, but that's only one of many. There's also the slowing of technological progress; the second industrial revolution ended around 1870, leading to a period in which not much change occurred. Likewise, we've recently broken Moore's Law, which states that transistors on integrated circuits will double every two years. Many consumers may have noticed that their computers from several years ago are competing fairly well against newer models because of a lack of significant improvement in processing power. Instead, the trend has been toward miniaturization which is more of "improving" than it is "innovating". There's also the feeling of disenchantment with the government, which was in many ways exemplified by the Occupy Wall Street movement. During the Victorian era, something called the "old boy network" effectively controlled who was in positions of power. The old boy network is the practice of only hiring friends from private school, and it keeps out anyone who wasn't able to attend prestigious, high-end private schools. While our problem today is dealing with the overinflated influence of money on our government, they were dealing with the old boy network, which is effectively a form of nepotism. Both problems reduce the effectiveness of government, and undermine public faith in those systems. You could even make a solid argument that they had a proto-internet in the fin de siecle in the form of the telegraph. There are huge parallels between telegraph culture and internet culture, including over-the-wires dating, "internet speak", and more. You can read about Tom Standage's book, The Victorian Internet, here if you're so inclined, but you can also just take my word for it. Even the science fiction of the fin de siecle, such as H.G. Wells's The Time Machine, were critical of society. It doesn't seem like a huge stretch to say that the similarities between the end of the 19th century and the beginning of the 21st century have contributed to making Steampunk popular, given the above evidence. This strong a resonance is beyond simple coincidence. However, there's a significant difference between then and now which would make it even more enticing for some: hope. 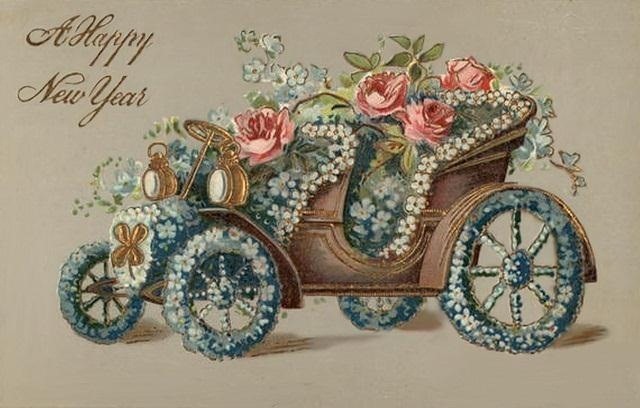 The fin de siecle was also characterized in many ways by the hope for a new future that would come with the new century. Today, we seem to have lost our hope that the future may provide something better than what we have. You can see this in the popularity of zombies in public media, because the horror of an era always defines what that era is afraid of. Popular horror in the Victorian era was composed of science (Frankenstein), the past (ghost stories), and the aristocracy (Dracula). Today we're afraid of the future and the past. The zombie apocalypse always happens in the future, right around the corner, and is composed of the literal past coming back to haunt us. Or plague us might be a better way to say it. People living during the fin de siecle were allowed to have hope, because they lived in a time before chemical weapons, biological weapons, and nuclear weapons. A man-made apocalypse was unthinkable to most, but many people today are convinced that mankind will be its own undoing. It seems natural, then, to want to look back to a time when only the very religious were afraid that the world was going to end. 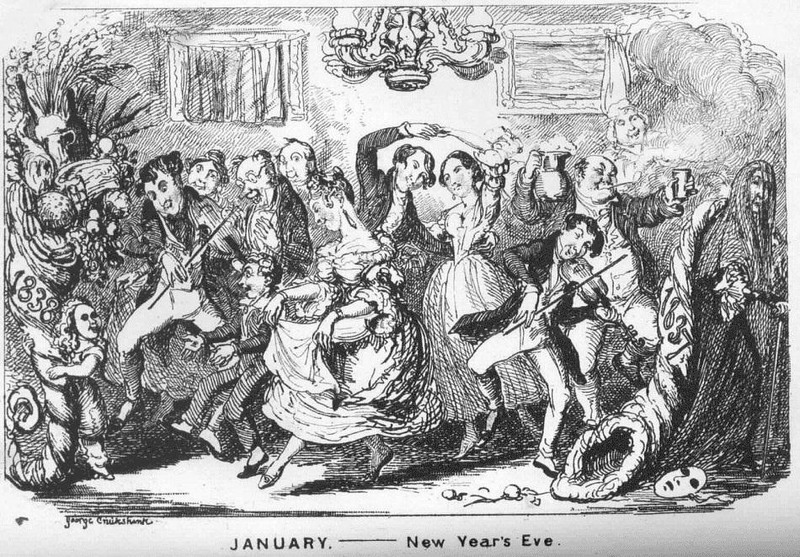 So as you celebrate the new year, consider the Victorians as they celebrated the turn of the century in 1899. Try to look forward with the same eyes that they had, and try to capture a little bit of their hopes for the future. Think about all of the fantastic things that waited ahead in the 20th century, and consider how many amazing advances must still be ahead of us in the 21st. 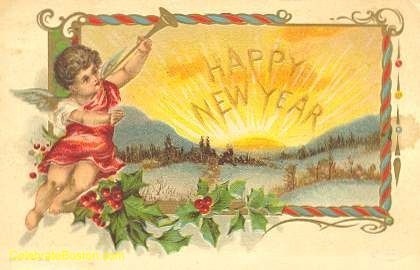 Above all else, have a happy, healthy new year!